I took the Moo's and some of my other paintings along to the Kingston Maurward Open Day back in June, it was a brilliant day and gave you a great taste of agriculture and the countryside alongside some fabulous local talent, food and live music. Sacha headed over to my stall, first attracted by the moo's and kindly bought one of my Mini Moo prints, we then got to chatting about my pet portraits and Sacha asked about having her gorgeous cat Jet immortalised in oils. 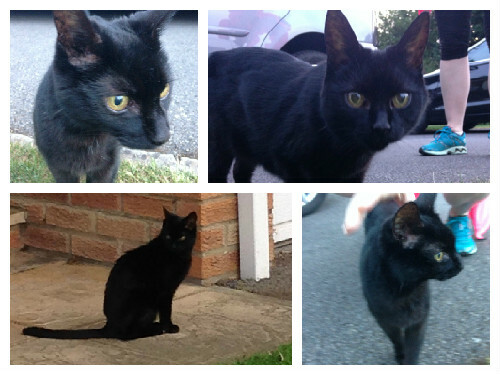 As you can probably tell by his name, Jet is a black cat, something I have never painted before so I was looking forward to the challenge! I don't think Sacha quite realised how much of a challenge she faced when trying to get some good photos but after a lot of attempts she managed to send over a great selection of photos so I could really get to see his character. 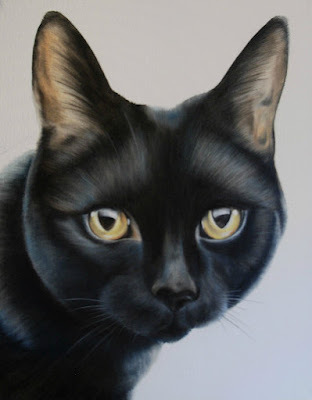 Now you may think that painting a black cat is easy, it's only one colour, but you're wrong! There's so much more to it and I had to be quite formulaic in my approach, preparing a range of shades and really trying to identify the various tones in his fur, it's amazing when you really look at the picture how many different colours you actually see, from browns and greys to blues and greens it's all there! The part I loved most was his eyes, cats eyes are always stunning and Jets are no exception.